You have an amazing topic and you want to share it to help improve your position as a thought leader…but now what? Truth be told, audiences show up for information, but they stay for the stories. Told well, stories can be the key to a compelling presentation that excites, energizes, and truly engages the people sitting in front of you. Let’s face it, as an industry vendor your audience doesn’t want to hear about you, they want to hear how your organization has positively impacted one of their peers and how your expertise is credible and of value to them. Remember, your presentation isn’t a sales pitch; it’s a way to showcase your expertise. When a claim or point is made during a presentation, the audience initially may be reluctant to concede or agree to the validity of the point. Often this is because the audience doesn’t initially accept the speaker as a trustworthy authority. However, by incorporating a customer co-presenter they are able to reinforce your position as an authority to speak on the subject. As a subject matter expert, it’s your job to educate your audience. So provide great, practical information that is helpful to your listeners. 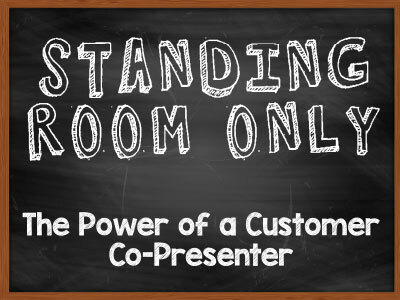 A customer co-presenter can help your audience get to know you without obligation, get a feel for your personality, style, and expertise through their eyes, which frankly, is one of the most powerful sales opportunities. The audience who likes your approach will either hire you or spread the word about your company. Find a customer co-presenter that will tell your story better than you can, who is passionate about what you do for them and is credible in the industry. There won’t be an empty seat in the room, and your audience will thank you.